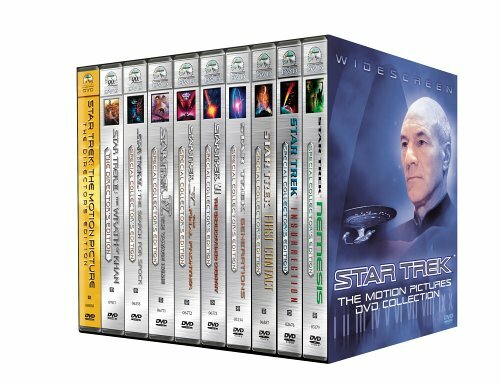 Spanning two decades and countless light years of interstellar adventure, Star Trek: The Motion Pictures Collection is a testament to the enduring goodwill of Gene Roddenberry's optimistic sci-fi concept. Long before Star Wars sparked an explosion of big-screen science fiction, Roddenberry had planned a second Star Trek TV series; the project fizzled, but its pilot script evolved into the first film in Paramount's most lucrative movie franchise. Despite its sluggish pace and bland "pajama" costuming, Star Trek: The Motion Picture (1979) offered a welcomed reunion of the "Classic Trek" cast, packed with Douglas Trumbull's still-dazzling special effects. Trekkers were even more ecstatic when The Wrath of Khan (1982) revived the spirit of the original series, even though director Nicholas Meyer was a Trek neophyte. With Leonard Nimoy directing, The Search for Spock (1984) began where Khan left off, with a thrilling (albeit contrived) obligation to resurrect the formerly ill-fated Mr. Spock. A box-office smash, Nimoy's The Voyage Home (1986) is the franchise's most accessible adventure--a high point offset by William Shatner's comparatively dreadful Star Trek V: The Final Frontier (1989). Meyer (and his penchant for quoting Shakespeare) returned for The Undiscovered Country (1991), a conspiracy thriller that put the series back on track, inspiring fans to invoke the "even number" rule in rating their franchise favorites. Generations (1994) gracefully passed the torch to TV's The Next Generation, bidding farewell to Captain Kirk with honor and integrity intact. Highlighted by the evolving humanity of Brent Spiner's android Lt. Cmdr. Data, First Contact (1996) explored Star Trek history with a logical (hint) surprise encounter, and Insurrection (1998) provided an adequate expansion of the successful NextGen series. Taken as a whole, these ten films demonstrate the consistent vitality of Roddenberry's original vision, stoking any Trekker's appetite for "ongoing missions" in Nemesis and beyond. --Jeff Shannon Most of the feature films were released early in the DVD era, but are represented here in their vastly improved two-disc special editions, which boast widescreen anamorphic pictures, director's cuts of the first two films, numerous commentary tracks by cast and crew, humorous and informative trivia subtitle tracks by Michael and Denise Okuda, and a wide variety of new and vintage documentaries and galleries.